He’s back! The confirmation on Tuesday afternoon that Mario Balotelli’s transfer from Manchester City to AC Milan has been completed, pending a successful medical on Wednesday, represents the biggest step yet in the Rossoneri’s move to change the face of their playing staff. And more than that, it brings back a glimmer of the spotlight which has gradually found itself focused away from Serie A over recent years. With the losses of big names such as Zlatan Ibrahimovic, Samuel Eto’o, Wesley Sneijder and Thiago Silva over recent years, the Italian league has suffered more than any other as the football world moves tentatively into the Financial Fair Play era. 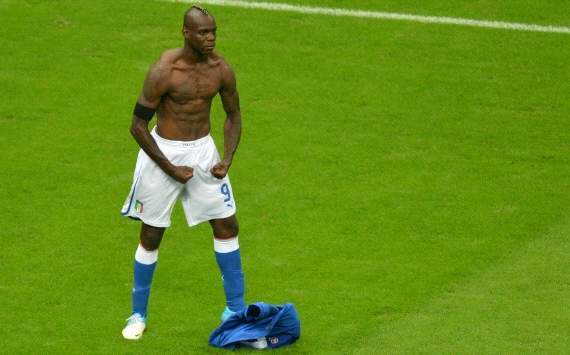 But with the return of Balotelli after two-and-a-half years abroad, headlines both on and off the pitch are guaranteed. ‘Super Mario’ demands attention. He is one of the most marketable faces in modern football, and as such represents the perfect opportunity for Serie A to flaunt its greatest wares in a way in which it has so far failed. There’s nothing supporters are drawn to more than talented, controversial figures. It has long been a rule of football, and is ever more so in these days of such widespread scrutiny. He may have a very different skillset to the giant Swede he effectively replaces in the Milan squad, but in so many ways, Balotelli is calcio’s new Ibra. He returns at a time when Milan are showing very evident green chutes of hope for the future, and amongst a panel of young stars in the current setup at Milanello, Balotelli is without doubt the standout talent. His bullet header and stunning drive in the Euro 2012 semi-final against Germany provided evidence of just how explosive he can be. He is the game-winner that Milan and calcio have both missed at times this term, and as he proved both on that great night in Warsaw, and with the Premier League-winning assist for Sergio Aguero against QPR last May, he is anything but fazed by big moments and the huge demands that come with them. There will be people on both sides of the pro-/anti-Balotelli divide in England following his spell at Eastlands, not least thanks to his tabloid-enthralling off-the-field antics which included picking up a bullied schoolkid and taking him back to school, as well as an infamous incident involving a box of fireworks in his bathroom. But now he is back in the bel paese at almost the perfect time. At 22, he is about to reach his core years as a footballer. If he sticks around at San Siro long enough to see out his four and a half year contract, he will be treating the Curva Sud to the peak of a career which promises so, so much. His explosive side needs to be better channeled – literally – but as with every flawed genius, the good is generally worth the bad. Whenever injured, suspended or simply seeking normality, Balotelli would spend his time away from Manchester City back in Lombardy. It was still his home, even if he was no longer an Inter player. Now, he is back where he belongs, and Milan and Serie A are all the better for it. Welcome back, Mario. We can’t wait for you to get started.